Like the Western custom of sending Christmas cards to friends and relatives, the New Year’s card (年賀状) tradition is rooted in Japanese history. A way of letting friends and relatives, whom they rarely get to see during the year, that they were alive and doing well. A handwritten New Year’s card remain a strong tradition today, making December and January the busiest times for the Japanese postal services as they orchestrate the massive delivery on the first day of New Year. These days, it’s easy to grab a box of cards at the post office or jump online to pick out a design, but to many, crafting cards from scratch is a real pleasure and shows just how much you’ve thought about the person. Most of these have a Chinese zodiac sign of the year incorporated into the design along with a conventional greeting. I grew up watching my parents create these cards year after year with the format, medium, design, and creatives changing with the times. Having a father who fed us through his design work, our family saw an all-out effort to create our New Year’s cards every year: paint brush calligraphy, depicted illustrations of our family life, Chinese zodiac sign carved onto wood block stamps, Gocco screen printed cards finished with pearl color dust, a montage of family photos turned into a postcard, and more modern efforts where intricate Illustrator design printed at home using a recently purchased jet laser printer, etc. I have to admit, things got hectic at times, and likely this process added unneeded stress during the time of the year when life was busy already, but I appreciate it now knowing the heart and soul that went into the process. A fond memory I hold close to my heart. With the New Year approaching, thoughts wander towards families, relatives, and close ones. We got thinking about how much our work family and partners mean to us and wanted to share our sincere expression of gratitude for the year gone by, and wish you a prosperous and successful New Year. To that, we spent time crafting our own New Year’s card and we wanted to share with you the process that went into it (without the stress and anxiety, of course), so we created this video. When we began discussing the design approach for our 2017 New Year’s greeting card there were quite a few considerations. 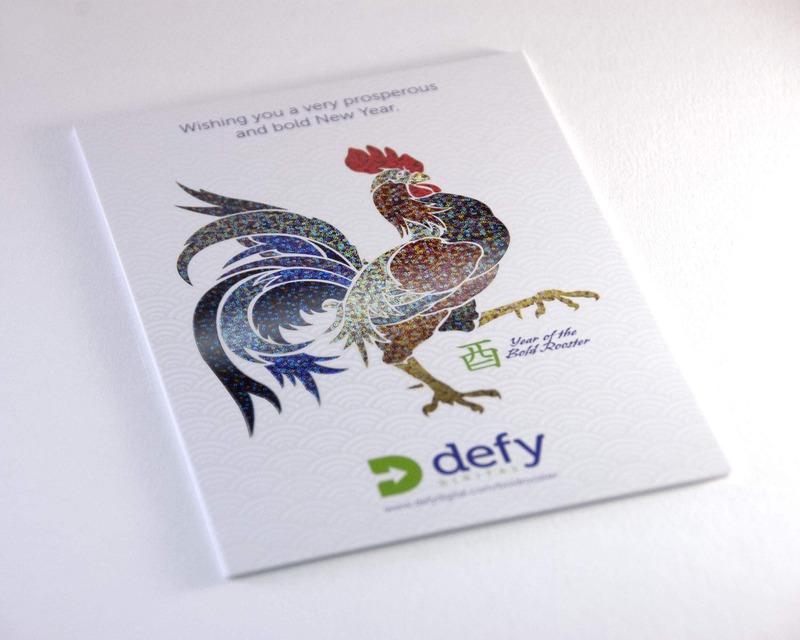 The idea that gelled with the Defy team was born from a combination of the Chinese Zodiac symbol for 2017 – the year of the rooster, Japanese New Year’s greeting card tradition, and expressionist art. During our research, we discovered the 1911 “Bold Rooster” icon, the emblem of Wallonia and of the French Community of Belgium by Pierre Paulus, a French Expressionist painter. As we forge ahead into 2017 we reflect on the past year’s highs and lows. Those experiences becoming building blocks that help us improve and refine our future actions. To make a significant and meaningful impact our resolve must be laser focused. At Defy Digital we encourage you to enter 2017 with a spirit of boldness that defies the norm. 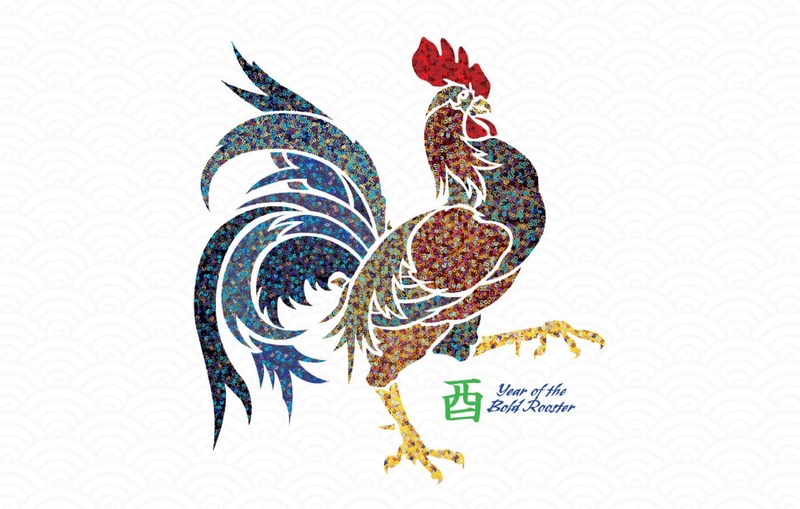 The Bold Rooster is a symbol for our organizational efforts in 2017. Our New Year’s greeting card is printed on fine grade matte cardstock utilizing colored foil and UV spot varnish. AkuaFoil is a printing technique where a liquid foil is applied in the desired area, then the color is printed on top. Areas with foil treatment have a brilliant metallic finish providing contracts to the areas without. We add the spot UV treatment to our background design to enhance the look. What is Your New Year’s Resolution for marketing and business? Share your comments below.